I really like this quilt. Does anyone know where I can find a pattern for it. That is a very cute quilt! I think it is probably an original. I agree with Tartan. The border is a relatively straightforward Lemoyne star variant. To make the flying geese section, cut a strip of freezer paper then draw in the geese for a PP pattern. I am sure you can download a witch coloring page that is close to this one. the background is relatively simple. The flowers(?) are the hardest part to duplicate. Hope this helps! It looks like it might be in this magazine. 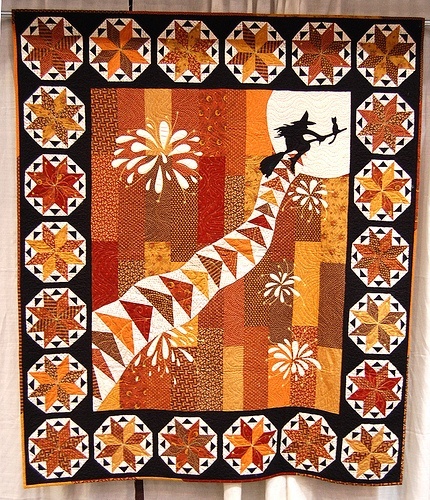 I remember seeing this quilt, or something very similar, at a national competition a couple years ago. i loved it then, and still love it. Unfortunately, I can't help with ideas for finding the pattern. Wow that is nice. Hope someone knows the answer. the flowers look reversed appliqued. Love it, couldn't find it googling but can't get into blogs. QB readers amaze me on how quickly they find out info on any question!! You are so awesome!!! It is a beautiful pattern! The flowers look like bursting fireworks and I'm sure you can google pics of fireworks and use them as design templates. It is in the Irish quilting magazine as stated below, I'm going to get one. oh my gosh, that is the magazine. hope it's available! I would change it a bit and put a few bats on the background near the Witch. cute, cute quilt. Thanks for the link. This is it. I will be ordering it. It is called Fireworks and Fun at Halloweeeen! by Terry McNeill. Can't find a pattern. Terry McNeill, the designer, has a Facebook page. Great pattern - thanks for finding it leatheflea! Can't wait to order it! But it is designed in Ireland I think by Terri McNeill, Creative Director of Irish Quilting Magazine and appears in the October issue of the magazine. But when I clicked on the image it was no available. Good luck with your search - hope this helps. She was ABLE to find it in this link that was also posted earlier in this thread. http://irishquilting.e-monsho.com/back-issues/Issue5 So I think the search is over! Just found her website - you could email her and ask about it.